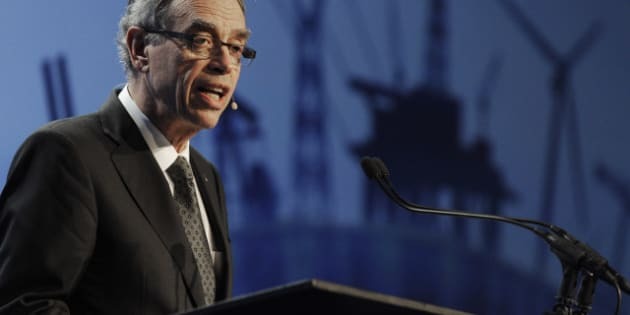 OTTAWA - Natural Resources Minister Joe Oliver says Canada wants to collaborate with the United States on common emissions targets for oil-sands extraction, fracking and other non-conventional sources of oil and gas. Co-ordinated North American emissions standards have been the stated policy goal of the Harper government for years, but Oliver — speaking Monday in Washington after meeting U.S. energy secretary Ernest Moniz — said "we can move our collaboration to a higher level." "That was definitely one of the areas we want to collaborate on ... the area of non-conventional oil and gas production." Asked whether that meant a formal agreement on emissions standards for the sector, Oliver said he could not "answer that directly." "We want to work with the U.S. administration on a wide range of energy and environmental issues, including very specifically reducing greenhouse gas emissions from the development of non-conventional oil reserves. So you can sort of extrapolate from that as you wish, and probably will." Non-conventional sources cover everything from oil sands to shale gas and are the fastest growing area of energy production in North America. They are also at the heart of a raging environmental debate over TransCanada's proposed Keystone XL pipeline, which would carry Alberta bitumen and some U.S. shale oil to Gulf Coast refineries. The pipeline has become a highly charged symbol for climate change activists in the U.S., and President Barack Obama has sent mixed signals about whether he will approve the $5.4-billion project. "Canada remains confident that Keystone XL will be judged on its merits, and those merits are considerable," Oliver told a news conference at the Canadian Embassy in Washington. However, it has long been clear that wider political and environmental considerations are weighing on Keystone's approval. The U.S. ambassador to Canada cautioned last February that "we all need to do as much as we can" on climate change, and linked Keystone's fate to Canada's environmental record. Obama himself subsequently said in a June speech that America's "national interest will be served only if this pipeline does not significantly exacerbate the climate problem." The backdrop to Oliver's latest Washington visit — his fifth as a minister — was a leaked report that Prime Minister Stephen Harper has written directly to Obama on the issue. Regulations for Canada's oil and gas sector have been under negotiation for years between Ottawa, the Alberta government and industry representatives without producing a policy. It is not clear how adding the White House to the mix could affect those negotiations, but one Alberta source familiar with the talks said it may be designed to "set the cat among the pigeons." One longtime Washington observer on energy issues said reports that Harper is offering Obama "political cover" to approve Keystone don't ring true. The message consistently from Washington, said former Canadian diplomat Paul Frazer, is that if Obama is going to say Yes to Keystone "it would be nice to know you guys are doing something substantive and you're talking about it and people know about it." Harper's letter "could be political cover for the PM," said Frazer. "It's certainly not political cover for the president. The message from (Obama) really has been, I can't fight your fight." Oliver said he repeated his Keystone pitch to Moniz, but he did not draw a direct link between oil and gas sector regulations and U.S. approval of the pipeline. The minister said he came to Washington to meet the U.S. energy secretary to "enrich that relationship" — and that he was not meeting with any other stakeholders or lawmakers. "I made the point with him that we stand ready and eager to work with the Americans on a whole host of issues, including the development of our non-conventional resources."